Do any two words roll of the tongue better than "Spring Lamb", and over the next few months we will be working hard to produce the most succulent and tender lamb possible. So what makes spring and lamb go together? Our lambs were born during August, so got off to a very wet start, but looking forward to a sunny spring, when the grass will be lush and mum’s milk plentiful. 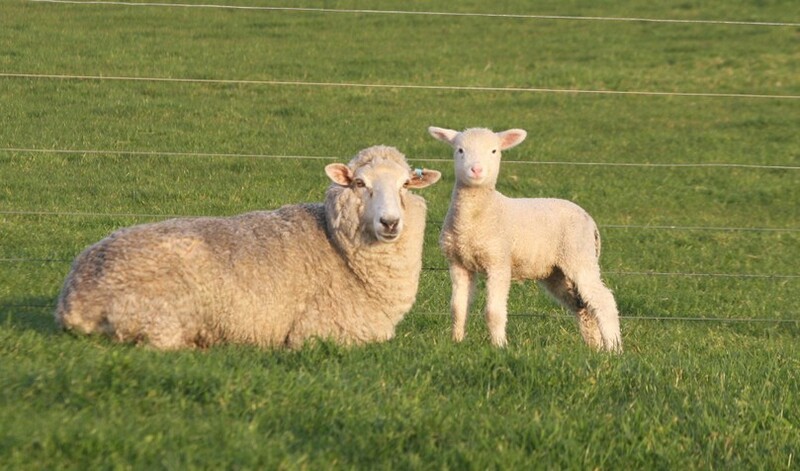 These conditions are what makes spring a great time to be growing and fattening lambs. The lambs are born weighing around 3kg. With growth rates of 300g/day, our lambs are ready for market after 4-5 months at weights of 40-50kg. More on that in later blogs. But for now, even for a hardened farmer, the lambs are fun to observe! For the first week or two they stay close to mum, but gain confidence over time to move away and hang out with other lambs to do their playing. You can see them in mobs of 6-10 exploring any features in the paddock, old tree stumps, wombat holes….. whatever, jumping about, or running after each other. However, once disturbed these brave creatures race straight back to the protection of mum’s milk supply, and when the twins hit the udder (at pace), you can see the back end of the ewe lifted off the ground – ouch! So we currently have ewes and their lambs spread out over half the farm, but we also have a few "carryover" lambs from last year’s drop. These sheep weren’t ready to sell last season, so we carried them over winter to fatten this spring. We had some of these on display for a tour group last week, and had a close look at their mouths. Why their mouths? Because now that they’re turning 1 year old these lambs will soon start to develop their first 2 adult or permanent teeth (as opposed to the milk teeth they have had up until now) This means they are no longer lambs but "2 tooths" or hoggets. The adult teeth erupt in pairs, with 2 teeth coming through every 12 months until they have developed a "full mouth" – around 4 to 5 years old. Now, although we sell the "2 tooths" at a discounted rate to the lambs, some people are big fans of this meat. The carcasses are usually bigger, so a roast leg can feed the masses, and some say the 2 tooths have much more flavour, but perhaps not as tender as the traditional spring lamb. It’s to be expected that the older the animal, the tougher the meat might be, but this can be compensated for with the cooking technique. Long slow cooking can help tenderise lots of cuts. We have been working our way through last season’s supply of lamb in the freezer, and when it comes to using the shoulder meat, I found a great stew recipe in The Age Epicure that has worked well over winter. Basically, mouthsized chunks of shoulder meat cooked with garlic, anchovy fillets, tomato paste, bay leaves and rosemary in a casserole dish with red wine and some water at 150C for around 3 hours or until the meat is tender. Toss in some parmesan and parsley at the end, and serve!